Washington's oldest wildlife area, this 23,000-acre site is under restoration by the WA Department of Fish and Wildlife to reduce fuels, increase wildlife habitat, and return fire to the landscape. In 2015, the areas that had been treated with prescribed fire helped stop the Okanogan Complex Fires from advancing. The Lime Belt Fire, part of the 2015 Okanogan Complex Fires reached into the Sinlahekin Wildlife Refuge, causing significant damage to some areas, but not others. What made the difference? Both sides were thinned in 2002 and 2011 to reduce fuels, thin stands, and restore some natural clumpy groupings. But due to very steep slopes and other prohibitive factors, the area on the left was not prescribed burned, while the area on the right was treated with prescribed fire in 2005 and 2014. Another view of the same affect, where the areas that received prescribed burning more successfully resisted wildfire. An interior view showing extensive damage to areas that had not been treated with controlled fire. Interior view of areas that had previously been treated with controlled burning. Overview of the Sinhlahekin Wildlife Area. Controlled burns made the difference — between green and charred, between resilience and destruction. And once is not enough. While eventual maintenance burns are faster, less expensive, and produce less smoke, the need for fire never goes way. 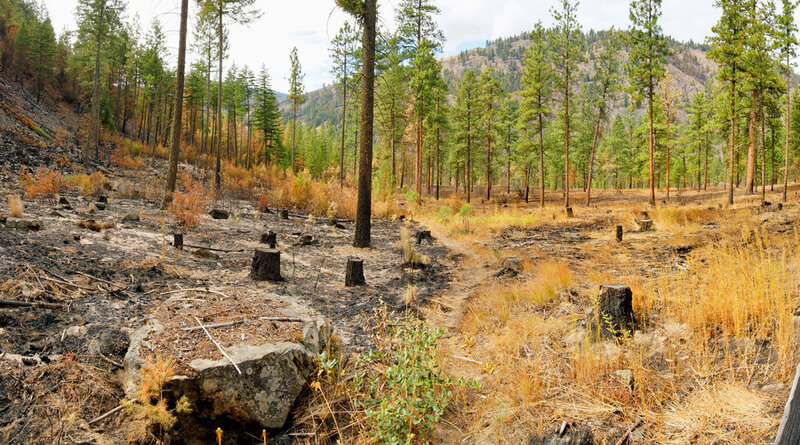 When most people think of wildfire, they think of dry forests — and there are 2.8 million acres in the Okanogan-Wenatchee National Forest alone. But there is often little discussion of why these forests (and their inhabitants) actually need frequent, low-severity fire. 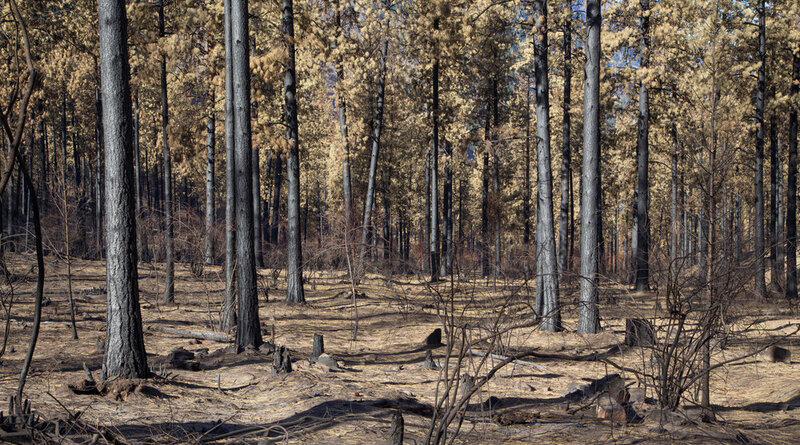 Fire thins small ponderosa pines, creating larger, healthier trees with less competition for scarce water and nutrients. 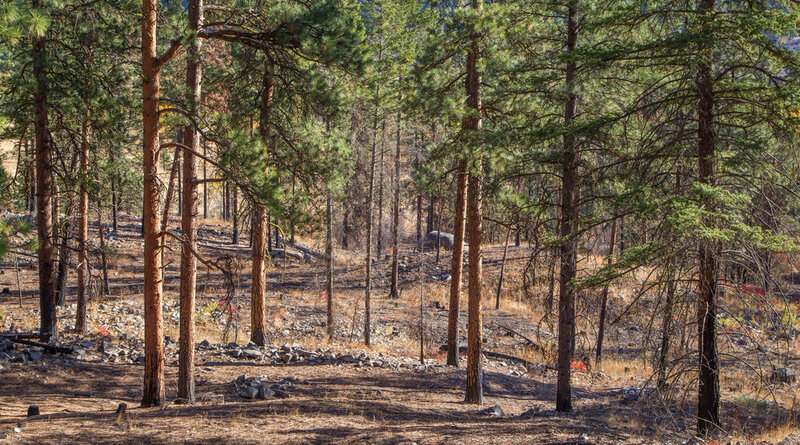 Fire reduces ground litter allowing more understory vegetation to grow. Heat from induces germination of buckbrush (mountain balm) which comprises over 50% of deer's winter diets. For more on historic fire regimes and recent fires in the Methow Valley, check out this Conversation article. Within sight of the Capitol lies some of the last fragments of lowland prairie and oak woodlands in Western WA. Over the last 10 years, the Puget Sound Ecological Burn Program has brought together land managers and scientists to restore and protect the diverse wildlife and plants that call it home. 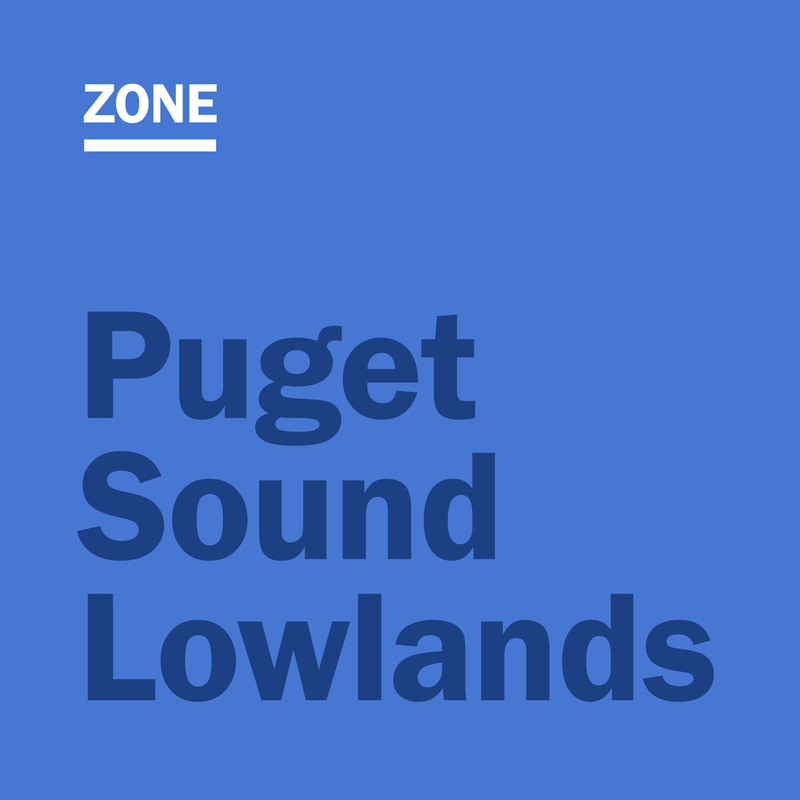 Although it doesn’t look like it today, fire-dependent lowland prairies once dominated the Puget Sound region, interspersed with oak woodlands and conifer forests. Years of habitat fragmentation, encroachment of invasive species, and lack of managed fire has reduced the extent of these ecologically important areas and impacted the wildlife that rely on them, including threatened and endangered species like the Taylor’s checkerspot butterfly and streaked horned lark. 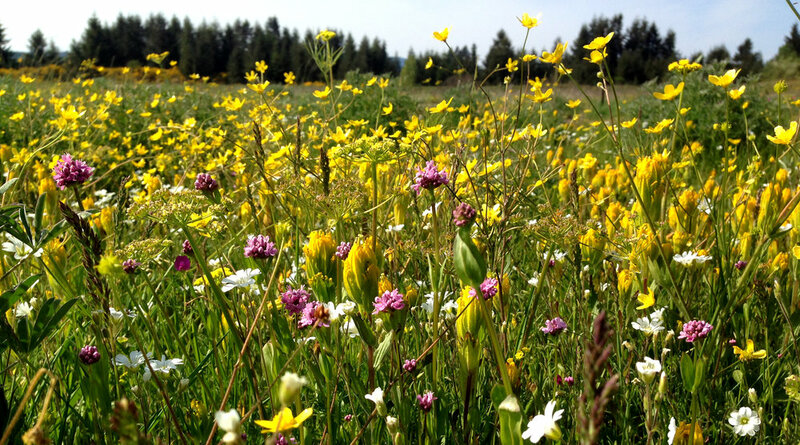 Today, the partners of the Puget Sound Ecological Burn Program and a diverse group of land managers restore these prairies through active ecological management on a large scale in the south Puget Sound region and the San Juan Islands. By connecting and sharing resources over the entire region, the partners overcome challenges and are able to use fire as an essential and necessary tool for restoration. Prescribed burns take significant planning and coordination. The strong partnerships found in the Puget Sound Ecological Burn Program make ones like this burn on Johnson Prairie possible. A Puget Sound Ecological Burn Program crew establishes a blackline at Johnson Prairie. A blackline is a control line established using fire to strengthen containment of the main prescribed burn. The crew listens as the Burn Boss gives the pre-burn briefing. These briefings include crew organization and assignment, current and future weather conditions, and objectives and plan for the upcoming burn. 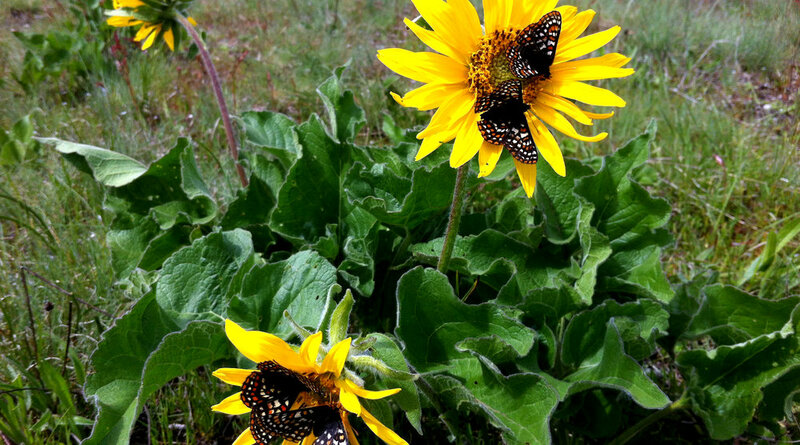 The federally endangered Taylor’s checkerspot butterfly is found only on limited prairie sites through Washington and Oregon. These butterflies rely on prairie flowers as larvae and nectar sources. The Puget balsamroot seen here is one such nectar source. 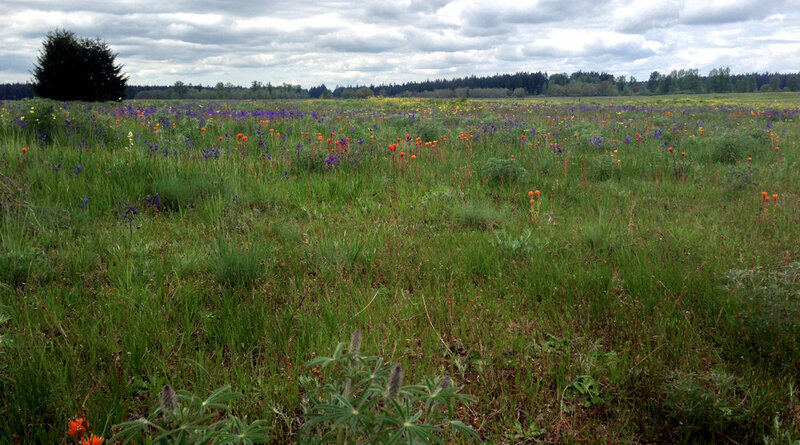 Prairie flowers are adapted to frequent fire and responded well after this burn on Glacial Heritage Preserve in Thurston County. Oak woodlands like this were once much more abundant in the Puget Sound region. 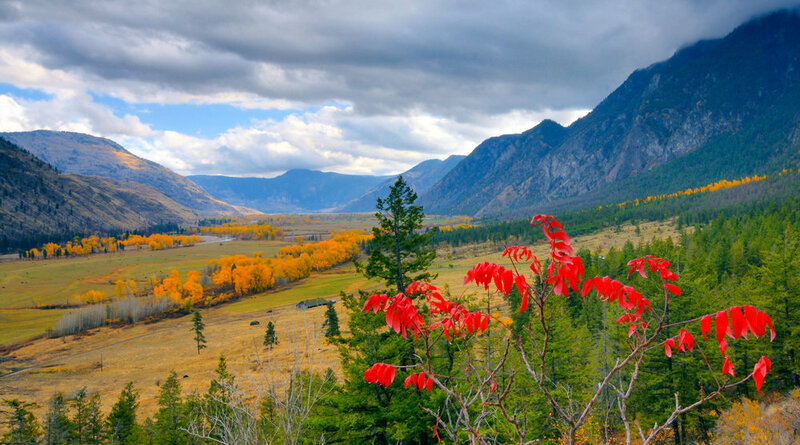 Land conversion and fire suppression have reduced the extent of these important and diverse ecosystems. Crews apply fire to the understory of these oak woodlands to open up the canopy, promote native plant growth, and reduce invasives. The streaked horned lark is a federally threatened bird that prefers open landscapes like the prairies and fields of the south Puget Sound region. Prescribed burning is used to maintain these prairies and keep plants relatively low and sparse, important habitat characteristics for larks. Puget Sound Ecological Burn Program crew members maintain the fire line on a burn in a recently released oak savannah at Mima Mounds Natural Area Preserve. A Puget Sound Ecological Burn Program crew member burns part of the prairie that has been set aside as a research plot to answer questions about how variations in fire intensity affect butterfly habitat. Research such as this increases our understanding of how fire can help improve future management. Many of the burners in this collaborative program are trained biologists. This approach ties research and management together to improve knowledge and create better outcomes. The Puget Sound Ecological Burn Program is one of the most active prescribed burn programs in the state, burning around 50 to 60 days a year between spring and fall and often with multiple burn crews a day. Success is tied to diverse interests coming together to recognize the strength of collaboration, including multiple agencies, organizations, and landowners. Visit South Sound Prairies to learn more. Eastern WA offers some of the most unique landscapes in the state, from shrub-steppe and desert wetlands, to Channeled Scablands and ponderosa pine forests. Managed by the U.S. Fish & Wildlife Service, these refuges provide habitat for migrating birds, elk, beavers, ground squirrels and many other species. These diverse Eastern Washington landscapes were shaped by ancient forces of water, ice, and fire. Today, prescribed burning continues to be an important tool for managing these areas and providing essential habitat for wildlife. The Mid-Columbia Wildlife Refuge Complex is a series of wildlife refuges across Eastern Washington and Oregon providing important habitat for Washington’s shrub steppe and desert wildlife, as well as being an important stopover places for migratory birds, including lesser sandhill cranes — a long-lived bird with high loyalty to chosen stopover sites. 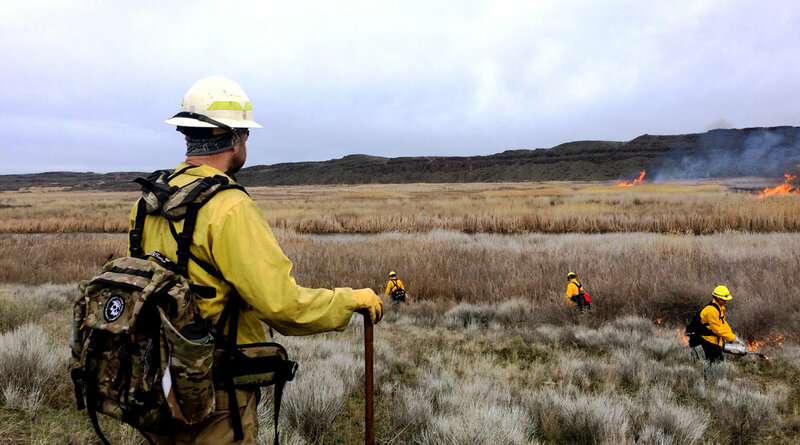 At Columbia National Wildlife Refuge, land managers conduct prescribed burns along the edges of wetland areas to reduce organic materials and promote growth of new grasses, an important food source for the energetic demands of the migrating cranes. On February 17, 2016 employees of the Mid-Columbia National Wildlife Refuge Complex, along with cooperators, burned 56 acres of grasses, shrubs, thatch and cattails for the improvement of lesser Sandhill crane habitat. By reducing accumulated organic materials, native grass regeneration is promoted, and access to food sources for the lesser Sandhill cranes is accomplished. Mid-Columbia Complex Fire Management were assisted by the Spokane area Bureau of Land Management office, U.S. Fish and Wildlife Service Inland Northwest Complex, as well as the Hanford County Fire Department. Large numbers of lesser sandhill cranes visit the refuge during spring and fall migrations. This photograph was snapped of the burn site a few days after the prescribed fire had been completed. The prescribed burn is expected to result in greater abundance and diversity of native species and improved habitat for the lesser Sandhill cranes as well as other native wildlife species. The cranes historically arrive at the Refuge in early to mid-March. "Crane use has been more consistent due to the yearly prescribed fire treatments that maintain open habitat for this long-lived migratory bird." Partnerships are essential to completing prescribed burning across the National Wildlife Refuges of Eastern Washington. At the Inland Northwest National Wildlife Refuge Complex local fire districts, the National Park Service, Bureau of Land Management and the U.S. Forest Service regularly assist with projects. This work has extended into important training opportunities with students at the University of Idaho and other partners. U.S. 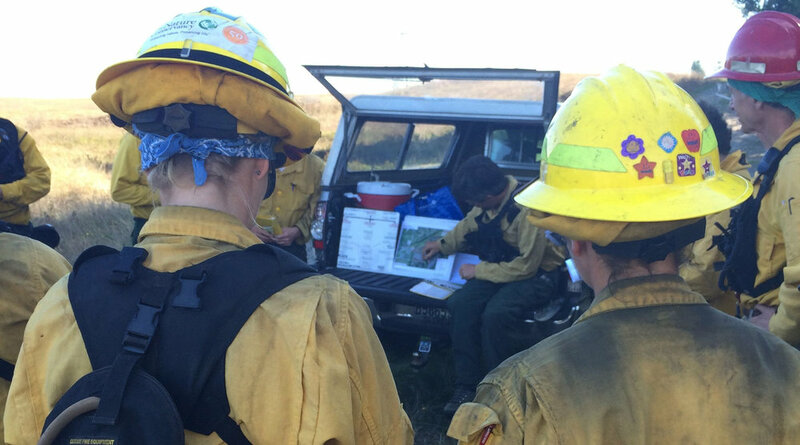 Fish and Wildlife Service staff from the Inland Northwest National Wildlife Refuge Complex (NWRC) and Mid-Columbia River NWRC, as well as cooperators from Spokane County Fire Districts 3 and 10, and students from the University of Idaho completed a 40-acre prescribed burn at Turnbull NWR in April 2016.. The prescribed burn is a follow-up treatment in a unit that was initially burned in 1992, and is intended to mimic the historic return interval of fire in ponderosa pine habitat. Prescribed burning in this habitat improves and restores ecosystem health, as well as reduces the risk of catastrophic wildfire - creating a healthy and more resilient landscape. A firefighter ignites in a willow stand overstocked with ponderosa pine trees. Reducing ponderosa pine density improves habitat diversity. Just south of Spokane, sits Turnbull National Wildlife Refuge, a unique refuge in the channeled scablands area of eastern Washington. Here the desert sagebrush transitions towards ponderosa pinealongside pocket wetlands. Within this refuge the Pine Creek Auto Tour takes visitors — about 60,000 to 70,000 per year — through the refuge and its diversity of habitats. Along the way, educational signs explain the benefits of prescribed burning in maintaining the landscapes in front of them.